“...I was sent ONLY to the lost sheep of the house of Israel." The great mystery of the Messiah's unaccounted history in the bible clearly may be explained: He journeyed to the Far East to search of the 10 Lost Tribes of Israel to preach them the Good News of the Kingdom of Heaven by keeping the Law of His Father and Testimony He was the Son of God... a mission He could not have accomplished during His limited 3 year ministry in Galilee or Judea for the simple reason that the diaspora of the true Hebrew children of Israel (see here) took place in 720 BC - some 750 years BEFORE the arrival of the Nazarene Messiah - by then most of the lost tribes had long left Judea. Keep an open mind as you read the evidence provided. I recall how as a teenager having been told of "Jesus lost years or missing years" and how the Bible nor the church (Rome) had an answer for them. Constantine and the Roman church has done much to both control the material that goes both in and out of the Bible. I believe they took extraordinary measures to protect and manage "their God" - both real and paganized - to the point of keep Him as "westernized" as possible. You may have heard, read or seen that there has been speculated within Christian circles and constant History Channel documentaries the claim that "Jesus" married, had a daughter, headed to France and England which eventually produced the "Royal family". Joseph Smith of the Mormons whose doctrines are as ridiculous or worse then Scientology claim "Jesus" went to the United States. So as you can see - all this perpetuates the "Jesus headed West" myth when the fact is, there is zero proof He did. In perpetuating this myth - new cults and countless millions of dollars has been made promoting this lie. On the other hand, the East documented the journeys and teachings of a Man who matches the Messiah perfectly. It makes perfect sense He would head there to search for the Lost Sheep of Israel. And keep in mind one very important fact - none of the countries where He is said to have traveled have ever sought to profit from it. In fact, they have always been very private about it to the point of keeping it almost secret within their records from the public. In fact, it is not until very recently that we know about it which came about thanks to American men who were curious to investigate the topic and spent much of their time and resources to get to the truth - and their findings have not produced for them any riches whatsoever. This alone should tell you a lot. NOTE: Contrary to claims made in one of the videos presented below, I believe the Messiah died at the cross and I also believe He did not marry. The above implies East of then Canaan and Sumer where Abraham was originally from. Clearly, the Messiah could NOT have encountered ALL the lost sheep simply in the province of Galilee and Judea - the above clearly points that they went EAST - ASIA which makes perfect sense that that is where He went to look for them which scripture states is one of the key reasons He was sent for. Don't lose your Shalom as you put it - the idea here is simply to look at the "big picture" - the Messiah went to search for the Lost Sheep of Israel. Period. A man who fits the description of the Messiah to the letter with His message is chronicled to have traveled to the east - that is ultimately the bottom line of this chapter. The Messiah was sent to earth by His heavenly Father for 2 purposes: (1) Preach the Kingdom of Heaven and (2) Find the Lost Tribes of Israel - which is precisely the same instructions He gave His 12 Apostles as the above scripture states. Furthermore, there are no less than 22 scriptures referencing Asia (see here) and the Book of Revelation passages 1:4 and 1:11 identify the (7) Churches of Asia ONLY - not the West, (i.e.,Europe, America or anywhere else) as many Christian evangelicals and programs such as National Geographic and the History Channel whose clueless "scholars" desperately try plant using historically unfounded connections of "Jesus" and Joseph of Arimathea heading to England and worse yet, "Jesus" being educated by Druids. Absolutely ridiculous attempts to explain justification and credibility of Templars, the Rosicrucians, America and England as the Lost Tribes of Israel, and the Luciferian "Royal Family" to the Abrahamic bloodline when they are anything but. There is an obvious avoidance of the massive evidence the Messiah went eastward to India. The fact is most of the true, legitimate,12 Apostles journeyed East - not West of Judaea (See here) just as the Messiah did and just as clearly, the message of the kingdom of heaven was meant solely and exclusively for the true, Abrahamic, blood-lineage lost sheep of the house of Israel - not Gentiles. This is not open to debate - it is a matter of scriptural fact. Take time to read "True-False Israelites" and "Black Persian Messiah" and "Prophetic Testimony" and you will discover the unsettling truth of the Hebrew children of the house of Israel and the connection it all makes with this chapter. Jesus and Moses Are Buried in India, Birthplace of Abraham and the Hebrews! Note: the Author of Nazarene Code makes absolutely no royalties, commissions, etc. from the books mentioned above. If these so-called Jews had been of the Lost Sheep of Israel, one may argue that the Messiah had "found them" in Judea which is the modern "State of Israel" - but by the Messiah's own Words, THEY ARE NOT. He therefore had to search OUTSIDE of Judea to find them. The so-called "lost years" and deeds of the Messiah are in fact chronicled in great detail in the Far East and the PRECISE SAME MESSAGE of the "Nazarene Code" is given there to His disciples to keep Testimony of the Son of God and keep the commandments of His Father - BOTH elements of The Nazarene Code found in the New Testament and Book of Revelation in the Bible. Since the Messiah's purpose for being sent was to preach the Kingdom of Heaven to the Lost Tribes of Israel (Matthew 15:24) which were not in Judaea since only the tribes of Judah and Benjamin were recorded to live there at the time after their conquest by the Neo-Assyrian empire around 722 B.C.E. In addition, the 12 tribes of Israel were calculated to have been approximately 2.5 million in number at the time of the Exodus when they were led out by Mosheh. These 2 facts therefore clearly indicate that the Messiah had to have journeyed to the Far East to locate and preach to the 10 tribes where they were found after the diaspora some 750 years prior where their numbers must have easily exceeded some 3.5 million by then which would have made it impossible for them to have all lived in the limited region below during the Messiah's brief 3 year ministry. You can look at the Map to trace the route of Jesus' ministry. Focus is on Geography and the life of Christ. The "Lost Years" of the Messiah from Christianity's perspective are fully accounted for in manuscripts in Syria, Baghdad, Persia, Afghanistan and India. Simply because Rome can't provide any evidence for His whereabouts or worse yet, may have removed scripture for some ulterior purpose does not mean you should dismiss any other explanation for it particularly if there is no ulterior agenda behind it - quite simply you don't see anyone or organization or religion getting rich in India from it. In some cases, as you will see, there is more proof found throughout the Far East of the Messiah's ministry then what is found in Judaea. Furthermore, Rome does not have exclusive license as to the history of the Messiah. If you read the chapter, "Prophetic Testimony" you will know that Buddhist and Vedic scriptures anticipated the arrival of One that could ONLY be the Messiah of the Bible as His life and achievements that was then and is now recognized by the great sages of the Far East as a great prophet, healer and "the best among men". In addition, He proclaimed Himself to be the Son of God and born to a virgin (Testimony), His engraved footprints matches precisely to those of the crucified Messiah and finally, His last words before His death in Kashmir to a trusted disciple were to to keep the commandments (Torah) of His Father - affirming conclusive evidence of keeping the Nazarene Code as He did in the New Testament and His Revelation to Yohanon. While the canonical gospels include two brief descriptions of the ascension of Jesus in Luke 24:50-53 and Mark 16:19 and a more detailed account of Jesus' bodily Ascension into the clouds is then given in the Acts of the Apostles (1:9-11), these accounts were added hundreds of years later since none of the original 4 canonical gospels included it. There exists glaring omissions to the resurrection and ascencion accounts of the oldest Catholic bibles recently exposed in Vatileaks (see here). This author has no doubt whatsoever that the Messiah is the Son of God the Father nor of His resurrection (see Testimony), however, my faith is not the least bit shaken but rather emboldened with the knowledge that the Man chronicled in India's deeds, proclamations, mandate and crucifixion "signature" is identical to the Man chronicled in the bible. Had the man in India proclaimed a different gospel, it would be very easy to refute the claim of the Messiah in India - but this is simply not the case. As many are aware, the bible put together by Rome is silent for the years after Emmanuel at 12 years of age until He "emerges" to begin His ministry at the age of 30 and is limited and somewhat innocuous mention after His resurrection. Yet His presence is fully documented in India and other regions of the Far East. The gaps of time the Roman empire church left out - perhaps intentionally or unknowingly - are well chronicled in the Far East. If you read the page "Prophecy" you will further realize Emmanuel's coming was anticipated to the letter by Buddha and in the Veda scriptures many hundreds of years earlier. Perhaps not so coincidentally, several attributes that are very unique to Eastern philosophies are echoed in several aspects of Emmanuel's gospels. 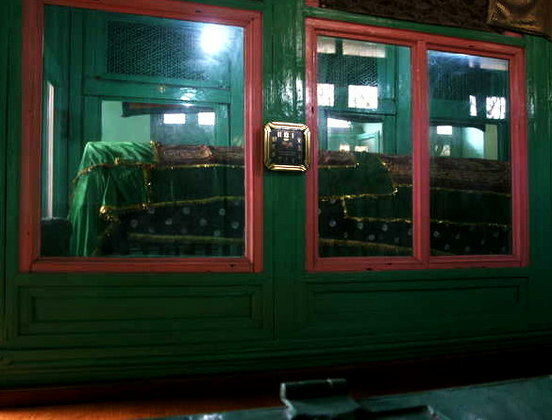 In fact, at the throne of Solomon’s Temple in Kashmir, a building constructed around 78 AD, some 45 years after the crucifixion, are inscriptions in the stone that say, “At this time, Yuz Asaf proclaimed His prophethood and He is Jesus – prophet of the children of Israel” (43:05 mark Jesus in India - Beyond Belief video below) which tells us He succeeded in His mission to locate the lost sheep of the 10 tribes of the House of Israel to preach them the Good News of the Kingdom of Heaven – which correlates perfectly to His stated mission found in the biblical scripture. While the videos below provide compelling evidence of His journeys throughout the Middle and Far East, they fail to explain WHY the Messiah went there. The reason was to search for the Lost 10 Tribes of Israel and preach to them the Good News of the Kingdom of Heaven which ultimately, leaves no doubt He was there. 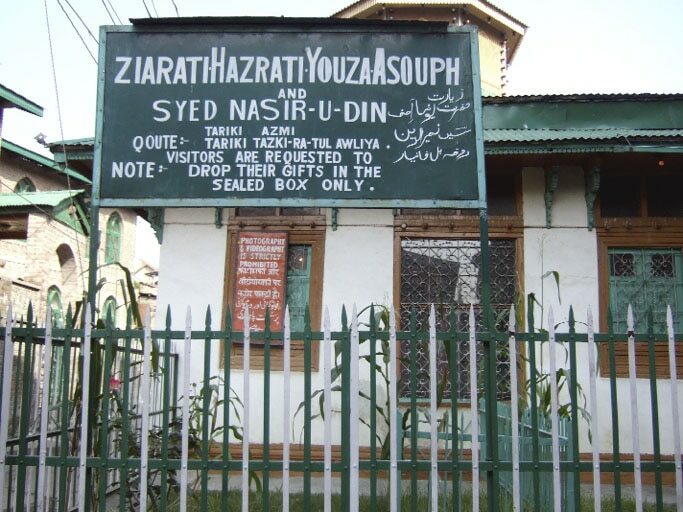 Youza Asouph) ( https://en.wikipedia.org/wiki/Roza_Bal ) in the center of Srinagar’s old part of town in Kashmir, India. The name Yuz Asaph is said to relate to Jesus. Ruazabal, means the ‘Honored Tomb’. It is known as the tomb of this very Yuz Asaf (pronounced as “Youza Asouph”, where Yuzu means Jesus and Asaf in Hebrew means gatherer – one who was to collect the lost sheep of Israel). It is said that the Prophet Yuz Asaf arrived from Syria about two thousand years ago. Some believe that Jesus survived the crucifixion by the Romans and somehow escaped back to Kashmir (a distance of around 2,500 miles) along with his mother Mary and a handful of followers. According to this theory Jesus lived until he was 80 years old in Kashmir, where got married and fathered several children as well. 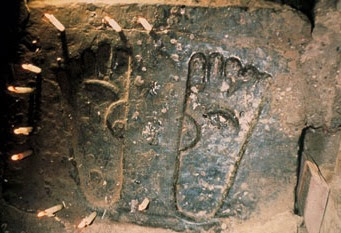 Direction of the grave – Researchers have stated that the direction of the actual grave is in an East-West facing direction. This is significant as this is the direction in which the Jews buried their dead, not in the direction traditional for Muslims, with the right shoulder facing towards the Qiblah. If Yuz Asaf is a Muslim saint as some argue, then why is his tomb in a Jewish-style east-west grave? According to Stephen Knapp, "Some say that Youza Asouph (or Yuz Asaph) means the gatherer, which could be in relation to the idea that Jesus was a gatherer of the lost tribes of Israel, some of whom were known to have come to Kashmir. Others say the name means the leader of the healed, since Jesus was a healer. While still others say the name Youza Asouph means Joseph’s son." served to show me another aspect of the life of the Messiah in the Far East I was not aware of. The Nazarene Code is echoed after the 50:14 mark by the narrator who states, "The Savior" (TESTIMONY) who upon his imminent death gives His unwavering message, "Now at this last moment, my spirit is ready to fly towards the Holy One... it is necessary for all of you to follow the commandments (LAW/TORAH) of God"... None should go towards the untruth leaving the truth" - thus leaving no doubt that He is one and the same Messiah by keeping consistent the same, consistent message echoed throughout His ministry in Galilee and Judaea. enhance it. 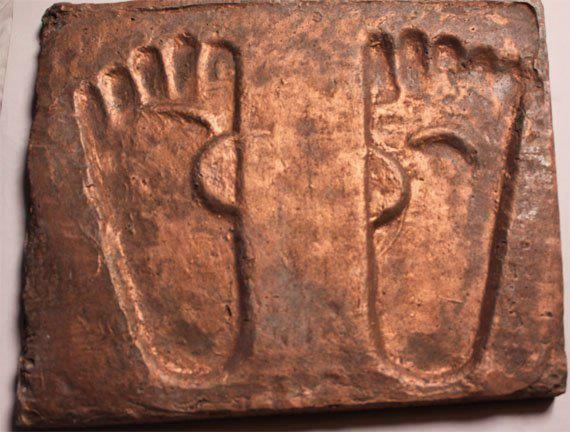 He appears to have left His "footprint"
Judea during His human lifespan here on earth. Note the Title and Name on Sign of Hazrati Youza Asouph (Yuz Asaf) - it means: (His) Holy Son of Joseph. Hadrat or Hadhrat (Ḥaḍrah, Arabic: حضرة‎; Hazret or Hazrat) is an honorific Arabic title used to honour a person. The literal translation of Hadrah is "Presence". In usage it is comparable to traditional Western honorifics addressing high officials, such as "Your Honour" (for judges), "His Majesty" (for royalty), or "His Holiness" (for high clergy). There are twelve great Hazrats in the Islamic faith, among those being Muhammad, Abraham, Noah, Moses and Jesus. This documentary presents a realistic map of Yashaya's travels towards to East which was chronicled as "The Life of Isa - the Best of Men" by Buddhists Lama's 3-4 years after the crucifixion. In addition, Far Eastern philosophies are compared to the Messiah's teachings for their similarities. which is pure propanganda with nothing to support it. Immanuel's journey to the Far East connects him there given the Prophecies of Buddha, the Vedas and the 3 wise men who traveled from the East, knowing of His prophesied arrival. The overwhelming evidence that places the Messiah in India, Nepal, Tibet, Iran and other portions of the Orient explains not only His absence from the bible, but why a score of individuals to this day still keep The Nazarene Code - the Law & Testimony - that He preached almost 2000 years ago which overwhelmingly supports the true location of the lost tribes of Israel. The Messiah laid the groundwork in India for His Apostles Bartholomew and Thomas to follow. The missionary work of Bartholomew is linked with Armenia (present day Armenia, eastern Turkey, northern Iraq, north western Iran) and India. Other locations include Egypt, Arabia, Ethiopia and Persia (Iran). Traditionally he met his death by being flayed or skinned alive, and then beheaded. Derbent, north of present day Baku on the Caspian Sea may have been his place of martyrdom. Alternatively he may have suffered this cruel fate in what is now India. Thomas may have laboured for the Gospel in Parthia (including modern Iraq and Iran), but stronger traditions link him with southern India. Indian Christians from the west coast Kerala area claim they were evangelized by Thomas, who was later speared to death near Madras on the east coast. Mount St. Thomas, close to Madras is associated with his name. Apocryphal writings include the 3rd or 4th century Acts of Thomas, and the Gospel of Thomas. Thomas the Apostle (called Didymus which means "the twin") was one of the Twelve Apostles of Jesus Christ, according to the New Testament. He is informally called doubting Thomas because he doubted Jesus' resurrection when first told, (in the Gospel of John), followed later by his confession of faith, "My Lord and my God", on seeing Jesus' wounded body. Traditionally, he is said to have traveled outside the Roman Empire to preach the Gospel, traveling as far as India. According to tradition, the Apostle reached Muziris, India in AD 52 and baptized several people, founding what today are known as Saint Thomas Christians or Nasranis. After his death, the reputed relics of Saint Thomas the Apostle were enshrined as far as Mesopotamia in the 3rd century, and later moved to various places. In 1258, some of the relics were brought to Abruzzo in Ortona, Italy, where they have been held in the Church of Saint Thomas the Apostle. He is often regarded as the Patron Saint of India, and the name Thoma remains quite popular among Saint Thomas Christians of India. Editor's Note: Notice above where the disciples of Thomas were named "Nasranis" - obviously being Nazarenes. The Messiah's Mission: to preach the Good News of the Kingdom of Heaven ONLY to the children of the House of Israel which He preached to ONLY 2 of the 12 Tribes: Judah and Benjamin while He is is Judaea. Most had left to what would be the most nearby regions where they could better assimilate and where scripture from the Book of Revelation indicates the 7 Churches to be - ASIA.